After getting her film studies degree from York University in Toronto, C. K. Kelly Martin headed for Dublin, Ireland and spent the majority of the nineties there in forgettable jobs meeting unforgettable people and enjoying the buzz. She began writing her first novel in a flat in Dublin and finished it in a Greater Toronto area suburb. By then she'd discovered that fiction about young people felt the freshest and most exciting to her. You have most of your life to be an adult but you only grow up once! Currently residing in Ottawa with her Dub husband, C. K. is an aunt to twenty-one nieces and nephews, and a great-aunt to two great-nephews and two great-nieces. She became an Irish citizen in 2001 and continues to visit Dublin as often as she can while working on novels about young people. Her first young adult book, I Know It's Over, came out with Random House in September 2008, and was followed by One Lonely Degree, The Lighter Side of Life and Death, My Beating Teenage Heart and sci-fi thriller Yesterday. She released Yesterday's sequel, Tomorrow, in 2013 and put out her first adult novel, Come See About Me, in June 2012. Two of her recent contemporary YA books, The Sweetest Thing You Can Sing and Delicate, were published by Cormorant Books' DCB young readers imprint in 2014 and 2015. They also published her middle grade sci-fi, Stricken. In 2019 C. K. will make her horror debut with DCB under the name Cara Martin. Amira is trying to let go. Let him go. But the strings attached to first love are too strong to be traded in for a weak substitute. She tries, though, until she can try no more. When Amira’s estranged parents announce that they are going to try again to make their marriage work with a vacation away from her, she is whisked off to spend the summer with her Irish relatives. Normally this might have suited her just fine, but this coincided with the worst time in her best friend's life. Jocelyn’s brother is being sentenced for reckless driving and is facing time in prison. Jocelyn needed her. Three thousand miles away feels too far off to be of any help, but Amira has no choice. As she attempts to support her friend via Skype, Amira does her best (most of the time) to remain strong for her friend and be an obedient house guest for her aunt and uncle. Enter ridiculously alluring Darragh. Just Like You Said It Would Be by C.K. Kelly Martin is a timeless story of first love. 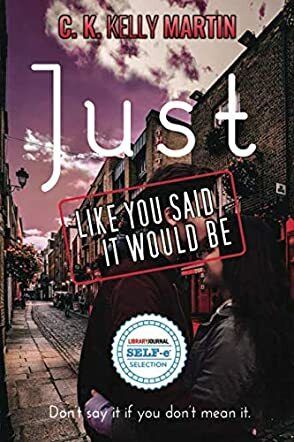 Martin’s insight into the female teen’s psyche is spot on, with descriptions such as “Neither of us spoke as she twisted my hair softly into place.” The author captures the heart and vivid imagination of romantic love. Although a bit too mature for the younger reader, be advised that the story content is well suited for the contemporary teen in its sexual theme. Just Like You Said It Would Be relates to the conflict of human emotions so relevant in a coming of age story.